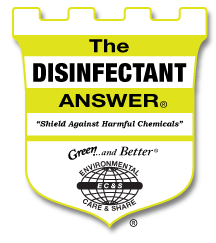 The DISINFECTANT ANSWER® is a game changer as it sanitizes, disinfects, deodorizes and effectively controls odor in one easy step- working virtually on almost anything that may cause harm. It's an all natural, multi-purpose sanitizer that will meet all of your disinfecting needs, still maintaining the value of eco-friendly responsibility that can be used on all highly touched areas. The DISINFECTANT ANSWER® is a game changer as it sanitizes, disinfects, deodorizes and effectively controls odor in one easy step- working virtually on almost anything that may cause harm. It's an all natural, multi-purpose sanitizer that will meet all of your disinfecting needs, still maintaining the value of eco-friendly responsibility that can be used on all highly touched areas. The DISINFECTANT ANSWER® is produced through a 'non-chemical’ means of electro-oxidation. Meaning, that The DISINFECTANT ANSWER® works electrically and not chemically providing the utmost impact. It’s The Answer® to helping protect your employees, clients, family and pets; without exposing them to frequently used hazardous and toxic chemicals, against germs, viruses or other infectious pathogens. The DISINFECTANT ANSWER® is proven to be effective on some of the most dangerous viruses without the use of chlorine bleach, nor does it leave any harsh chemical residues behind.